Location-based services like Foursquare may have popularised the idea of ‘checking in’ using an app, but the concept has since been expanded into a number of different directions by subsequent apps from a wide range of developers. Here we take a look at some of the many things you can ‘check in’ to. One of the current hottest ‘check-in’ areas is TV. Get Glue is probably the best known app for sharing what you’re watching right now. There’s a thriving community of people checking in to what’s on that box in the corner of their room, and there are virtual stickers and even real world rewards to be won if you check in to shows that the startup has commercial partnerships with. It’s mainly US focused right now, but has users all over the world. Miso is another TV focused check-in app. It allows you to get a bit more social with other people who are watching the same show, with comments available for each checkin. A fully fledged chatroom for everyone watching the same episode of a series would be even better. New technology is making checking in to a show even easier. Yahoo-owned IntoNow captures a snippet of the audio from the show you’re watching to identify it, while TVtak does the same using image recognition and your phone’s camera. These both make the process of checking in a much more casual affair, if the show you’re watching is supported. When it comes to movies, Get Glue and Miso both offer you the ability to check in to films too, whether they’re on TV or at the cinema/theater. 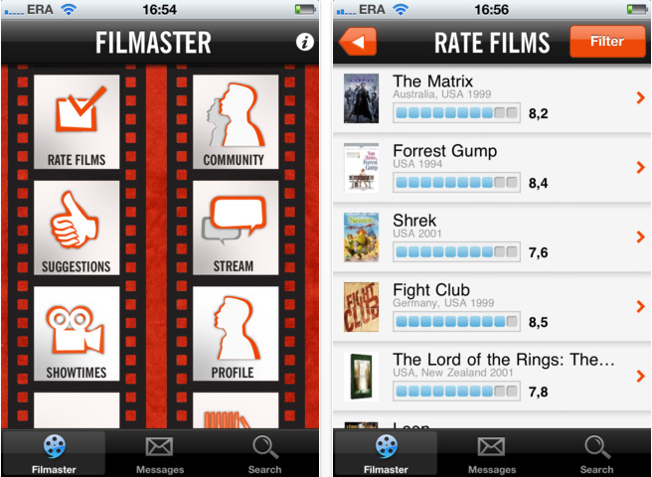 Taking things a step further though, Filmaster‘s iPhone app is designed as a location-based social network specifically for cinemagoers. You can check in to specific local screenings of films in advance, allowing you to arrange meetups with other fans of the same type of movie. We covered Filmaster in detail here, and the Polish startup recently received $250k USD in funding from German fund HackFwd, so expect to hear more about it in the future. Alcohol is inherently social and many people like to get together to enjoy a drink, so it makes sense to build a social network around it. Once again, Get Glue is in the game, with the ability to check in to wines. This seems a little at odds with the media-focused direction of the rest of the app, but if you enjoy a glass and want to see who else does too, it’s worth a look. 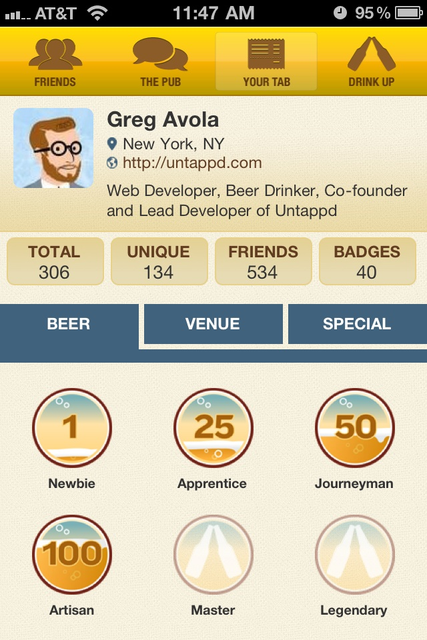 A more dedicated option is Untappd, a social network that allows you to share the beer you’re currently drinking. If you’re the type of person who gets excited by a fruity tipple from a little-known microbrewery, this is the service for you. You can rate beers as well as seeing who else is drinking them. A chart of the top-rated beers according to users helps you seek out new choices to delight your tastebuds. 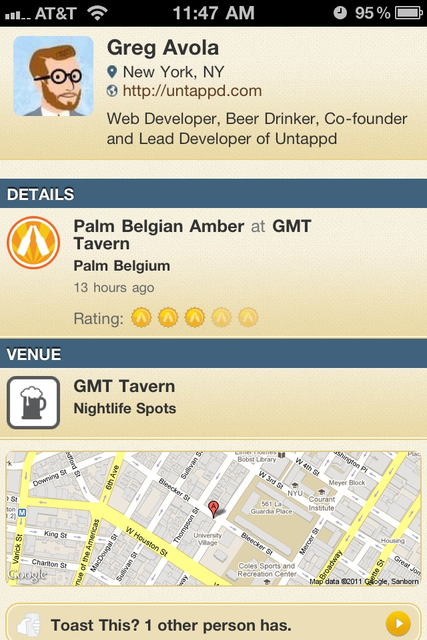 The service offers a mobile Web app to check in then you’re not drinking at home. 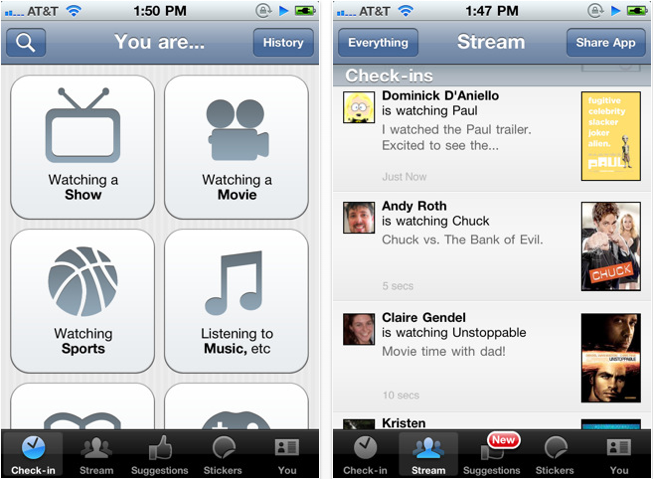 There’s also an iPhone app built on the API, called iTappd if you prefer the native app experience. 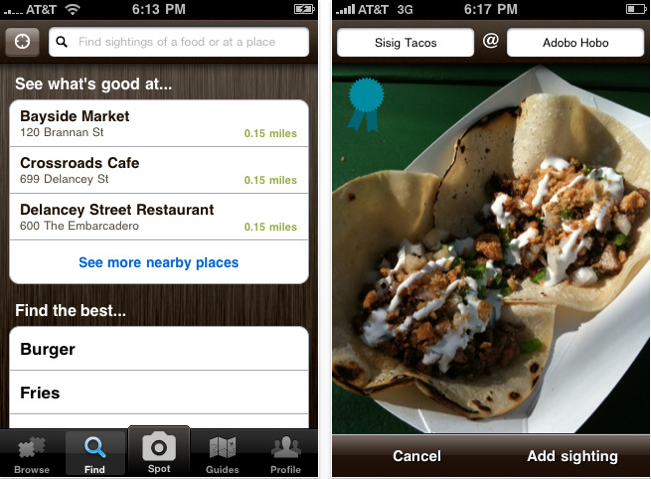 Foodspotting is the app you need if you’re looking to share what’s on your plate. Designed with restaurant-goers in mind, the app allows you to share a photo of the dish you’re eating and tag where you’re eating it. The result is a visual, geographic guide to good food, letting you browse a map of food photos to help you find inspiration for your next meal out. Recommendations can even be bundled into curated guides around specific areas or themes. Aiming to make flying to new places a little more interesting, a couple of services have emerged in recent months that aim to make your time airside more rewarding. Planely (covered in more detail here) is designed as a networking tool for people who want to harness the serendipity of finding out your perfect business colleague is on the same flight as you. LinkedIn integration helps you find out more about the background of other Planely users sharing your flight and you can then introduce yourself to anyone you’d like to meet up with either in the airport or on the flight itself. 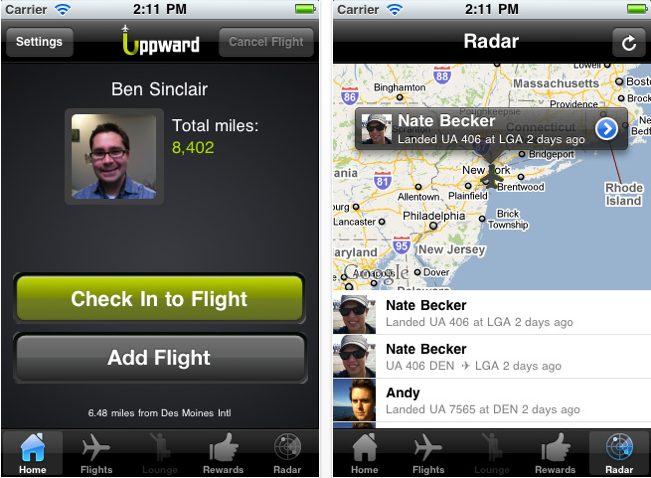 Uppward, meanwhile, is a more general social network for flyers which allows you to chat with other people taking the same flight as you. Check in using the app at both ends of your journey and you can earn ‘miles’ which can be translated into real-world rewards – currently Amazon vouchers. Okay, this one kind of overlaps with more general location check-in apps. It’s only natural that ‘check-ins’ would come full circle to the place where you’re perhaps most likely to ‘check in’ in real life – hotels. IMGuest is a service designed for people who want to network with other people at the same hotel as them. This could be particularly useful if you’re in town for a conference and want to get the most out of your time stuck at the hotel with nothing to do. 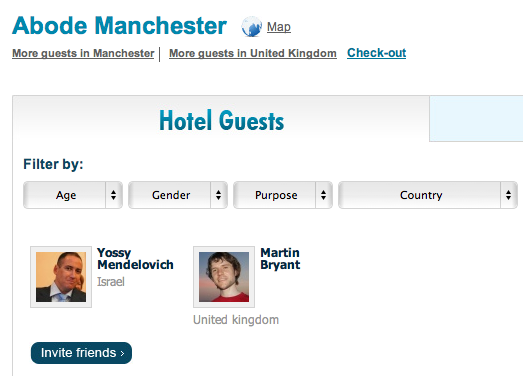 You can even ‘follow’ particular users and the service will alert you when they’re checked in to a hotel near you. We covered IMGuest in more depth here. 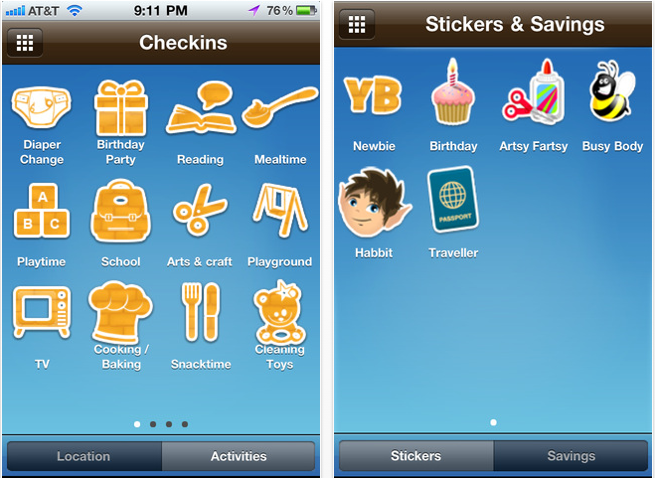 YellowBrck is an app designed to let parents share the activities they do with their kids, and the locations they take them to. The idea is that by sharing your activities with friends and other parents, in turn you’ll get plenty of inspiration from other users for ways to entertain your children. Discounts and rewards can be earned the more you use the app. “For example, try checking in a diaper change 3 times and see what you receive,” suggests the website – I’m not sure I want to know, but if you’re a parent looking to keep the young scamps busy, this is worth a look.